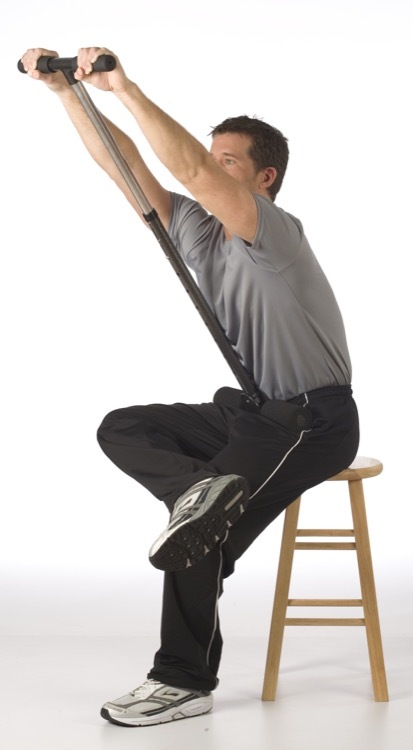 Basic summary: A rigid yet mobile and adjustable contraption that can be used for stretching most of the major muscle groups in your body, with primary effectiveness in the core muscles of your trunk, spine and hamstrings. The Medi-Dyne company straddles the two worlds of medical supplies and athletic performance gear. Accordingly, their products are somewhat equally targeted to health care providers and recreational athletes. 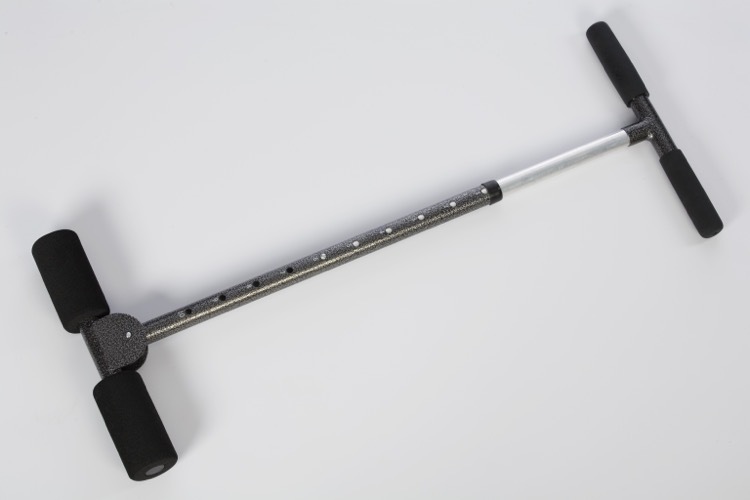 Case in point is the CoreStretch device, which was originally developed for use in outpatient clinics, to help physical therapy patients attain a focused stretch through the lower back and hamstrings while maintaining good body mechanics. Picture yourself sitting on the floor with your legs straight in front of you, in the classic “reach forward and touch your toes” pose. If you’re like the majority of people, a significant portion of that movement comes from rounding your shoulders and hunching through the rib cage, rather than hitting the intended target muscles. The CoreStretch remedies this by offsetting the axis of rotation in your hips, and forcing your pelvic bones to stay in proper alignment even when reaching forward. At the same time, the positioning of your hands on the top handle forces an elongation of the lower back muscles, similar to what you can accomplish with a low grade medical traction device. Your rib cage and shoulders don’t curve unnaturally, and all of the stretching is focused on the key areas of low back and hamstrings. This basic forward stretch can be accomplished in either the seated or standing position, and it’s easy to hold poses for extended lengths of time without other muscle groups cramping up or getting uncomfortable. We’ve found that when poses are held for a few minutes or more, there are often a few release points when your body reaches an initial limit, but as you remain in place and start to relax, you naturally fall deeper into the position. With the CoreStretch, it actually feels good to stretch our hamstrings and low back, instead of becoming painful. Forward flexion is just the beginning, as the CoreStretch is built to accommodate motion in all three planes. The pads that anchor against your hips can rotate laterally, and the handlebar twists about 45 degrees in either direction. Combining lateral and rotational movement with flexion allows you to stretch hard-to-reach areas, and moving in and out of these positions can help with muscle strengthening. You can also position your legs in various positions to direct the stretch toward specific muscles. 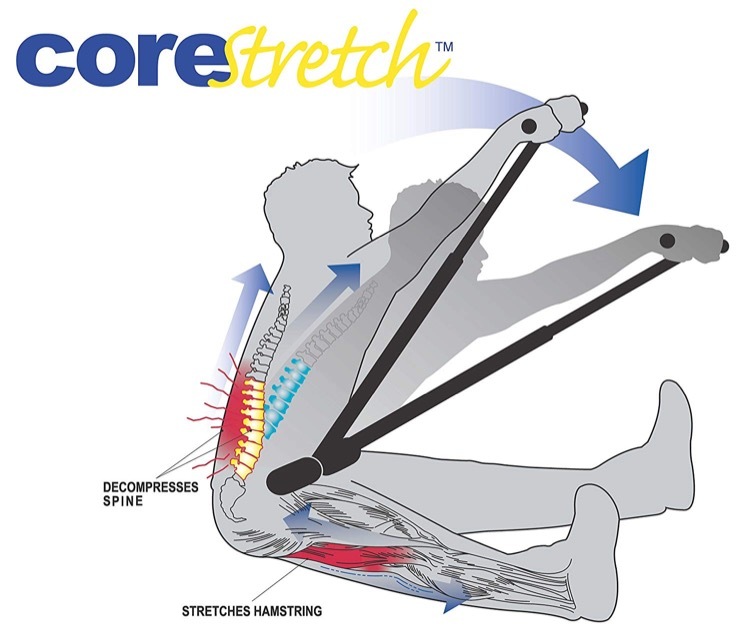 At first it’s hard to figure out how to target some of the smaller or deeper muscle groups, but the CoreStretch comes with a fully illustrated instructional guide (also available online) to assist with this. Stretches are broken down into beginner, intermediate, and advanced levels so you don’t accidentally play Twister with yourself before your body is ready. The CoreStretch has nice adjustability for people of different sizes, with 10 different quick-lock length options. It assembles easily and can be taken apart for storage in small spaces, but we usually just leave ours intact and leaning against a wall. On the product page, the CoreStretch has a long list of musculoskeletal conditions it can help with, and while some of these seem a bit of a (pardon the pun) stretch, the device is definitely the most efficient method we’ve used for getting a quality stretch from the hamstrings all the way through the shoulders. Since all of our motion originates from core muscle groups, keeping that area elongated and pain-free has a huge benefit for all types of athletes. Whether for injury prevention or to remedy a problem area, the CoreStretch is an effective and affordable tool to have at your disposal. The Medi-Dyne CoreStretch is available at www.medi-dyne.com.